Ch'ien Lung was the younger son of K'ang Hsi, and brother of Yung Cheng. Emperor : Kao Tsung using the title Ch'ien Lung. Date : After AD 1770. Denomination : Bronze cash. Mint : Ushi in Sinkiang province. Size : 25.0 mm. Weight : 4.32 grams. Grade : gF with a very clear mint mark. A little darker than the image suggests. 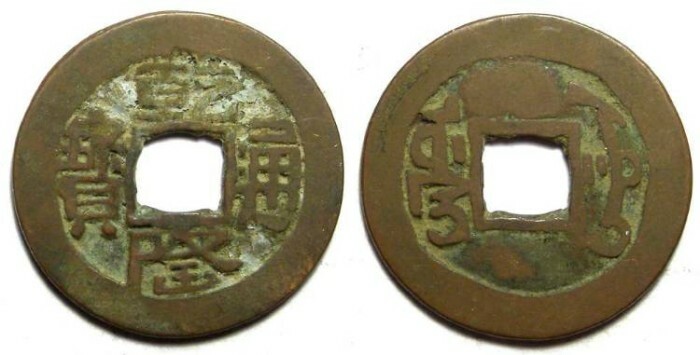 Obverse : "Ch'ien-Lung t'ung-pao". Note how there are two small uprights on the edges of the lower character, which indicate this is a commemorative or memorial issue. Schjoth states that these were all made during the period between 1796 and 1798 after Ch'ien-lung abdicated, but Hartill says that these were issued as early as 1770 at this mint. Reverse : "Ushi" in Manchurian script on the left, and in Arabic script on the right. Since the obverse is in Chinese, that makes this a tri-lingual issue.